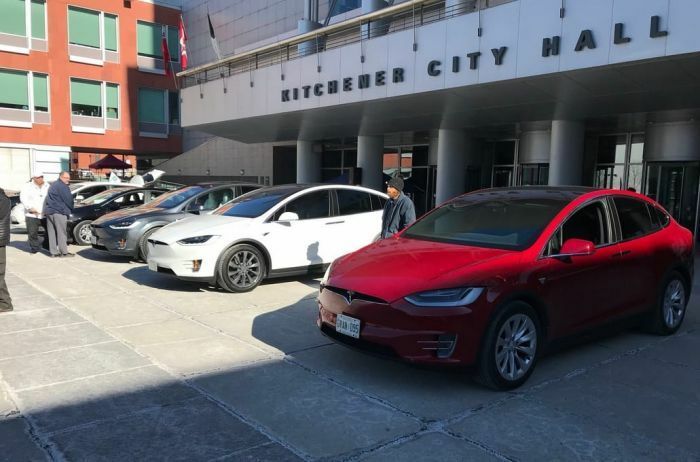 It was a great day talking EVs at Kitchener City Hall yesterday. A number of EV owners gathered at the City Hall to talk about their electric vehicles. Many EV owners came and talked to the public about the benefits of owning an electric car. I don't know if the event was organize by the City of Kitchener in Canada or by the Vaterloo Region EVA (Electric Vehicles Associations), which promotes electric car adoption and use with and around the Region of Waterloo, Ontario, Canada. But one particular moment was really cool. A trio of Tesla Model X vehicles presented a real dance. They danced under music using their falcon doors and headlights. It was very amusing for the viewers and I had never seen anything like that. The Model X dance video is under a minute and you can see how the falcon doors are doing up and down while headlines participating in the dance as well. Here is the tweet by the Tesla Model 3 Owners Club in which you can watch the video. Some people say it looks like a bunny hopping and made references to Easter Eggs. Once personc ommented and wrote that this is ridiculous. What do you think? Please comment in the comments' section below and let us know what you think for discussion. Apparently a decent amount of people have participated in the event yesterday. Here are several more pictures shared by the Waterloo Regional EVA. Also, see: Car Camping in a Tesla Model S vs. Model X vs. Model 3. Electric car popularity is growing steadily throughout the world. Amid surge in electric vehicle popularity, cities install charging stations. Many cities are starting small with EV charging stations. For example, La Crosse, Wis., is adding a single charging station to its downtown area that the local parking utility will oversee, La Crosse TV station WKBT-TV reports. It's amazing to see how the EV enthusiast base drive this growth. Do you see more charging stations installed in your city? Update: Here is a 4 minute video from the Model 3 Owners Club about the entire event yesterday at Kitchener City, where they were invited to to attend the Waterloo Region Transportation Symposium on March 25, 2018. Waterloo is considered the "Silicon Valley" of Canada.